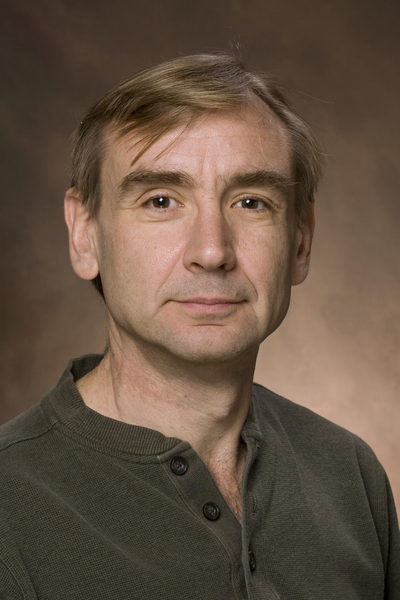 Eric Bachmann's research interests include human factors and training in virtual environments (VE), enabling immersed VE users to explore virtual worlds of unlimited size, and locomotion interfaces for virtual environments. The HIVE (huge immersive virtual environment) is a state-of-the-art virtual environment facility on the Oxford campus of Miami University. M. A. Zmuda, J. L. Wonser, E. R. Bachmann, and E. Hodgson, "Optimizing Constrained-Environment Redirected Walking Instructions Using Search Techniques," in press IEEE Transactions on ComputerVisualization and Computer Graphics, May, 2013. E. Hodgson and E. R. Bachmann, "Comparing Four Approaches to Generalized Redirected Walking: Simulation and Live User Data," IEEE Transactions on Computer Visualization and Computer Graphics, Vol. 19, No. 4, 2013. X. Yun, J. Calusdian, and E. R. Bachmann, and R. McGhee, "Estimation of Human Foot Motion During Normal Walking Using Inertial and Magnetic Sensor Measurements," IEEE Transactions on Instrumentation and Measurement, Vol. 61, No. 3, 2012, pp. 1-14. Hodgson, E., Bachmann, E., & Waller. D, "Steering Immersed Users of Virtual Environments: Assessing the Potential for Spatial Interference," ACM Transactions on Applied Perception, Vol. 8 Issue 4, November 2011. X. Yun, E. R. Bachmann, and R. B. McGhee, "A Simplified Quaternion-based Algorithm for Orientation Estimation from Earth Gravity and Magnetic Field Measurements," IEEE Transactions on Instrumentation and Measurement, Vol. 57, No. : 3, 2008. D. Waller, E. R. Bachmann, E Hodgson, and A. C. Beall, "The HIVE: A Huge Immersive Virtual Environment for research in spatial cognition," Journal of Behavioral Research Methods, Instruments, and Computers. Vol. 39, No. 4, November 2007, pp. 835-843. E. R. Bachmann, X. Yun, A. Brumfield, "An Investigation of the Effects of Magnetic Variations on Inertial/Magnetic Orientation Sensors," IEEE Robotics and Automation Magazine, Vol. 14, No. 3, September 2007, pp. 76-87. X. Yun, and E. R. Bachmann, "Design, Implementation, and Experimental Results of a Quaternion-Based Kalman Filter for Human Body Motion Tracking," IEEE Transactions on Robotics, Vol. 22, Issue 6, December 2006. E. R. Bachmann, and X. Yun, "A Single Parameter Tunable Quaternion Based Attitude Estimation Filter," Journal Navigation, Vol. 53, Issue 2, Fall 2006. D. Waller and E. R. Bachmann, "The Borderline of Science: On the Value of Factor Analysis for Understanding Presence," Presence: Teleoperators and Virtual Environments, Vol. 15, Issue 2, April 2006. X. Yun, E. R. Bachmann, S. Arslan, K. Akyol, and R. B. McGhee, "An Inertial Navigation System for Small Autonomous Underwater Vehicles," Advanced Robotics, VSP and Robotics Society of Japan, Vol. 15, No. 5, 2001, pp. 521-532. X. Yun, E. R. Bachmann, R. B. McGhee, R. H. Whalen, R. L. Roberts, R. G. Knapp, A. J. Healey, and M. J. Zyda, "Testing and Evaluation of an Integrated GPS/INS System for Small AUV Navigation," IEEE Journal of Oceanic Engineering, Vol. 24, No. 3, July 1999, pp. 396-404. E. R. Bachmann, M. A. Zmuda, J. Calusdian, X. Yun, E. Hodgson, and D. Waller, "Going Anywhere Anywhere: Creating a Low Cost Portable Immersive VE System," 17th International Conference onComputer Games (CGAMES), Louisville, KY, 2012. E. R. Bachmann, J. Calusdian, Eric Hodgson, and X. Yun,, "In-Situ Heading Drift Correction for Human Position Tracking Using Foot-Mounted Inertial/Magnetic Sensors," Proceedings of the IEEE International Conference on Robotics and Automation, ICRA 2012, St. Paul, Minnesota, USA, May 2012. X. Yun, J. Calusdian, and E. R. Bachmann, "Adaptive-Gain Complementary Filter of Inertial and Magnetic Data for Orientation Estimation," Proceedings of the IEEE International Conference on Robotics and Automation, ICRA 2011, Shanghai, China, May 2011. X. Yun, E. R. Bachmann, H. Moore, and J. Calusdian, "Self-contained Position Tracking of Human Movement Using Small Inertial/Magnetic Sensor Modules," accepted for publication in the Proceedings of the IEEE International Conference on Robotics and Automation, ICRA 2007, Rome, Italy, April 2007. B. J. Snow, P. Maynard-Zhang, and E. R. Bachmann, "A WiFi Based Personal Place Awareness System using Bayesian Learning," Proceedings of the Midwest Artificial Intelligence and Cognitive Science Conference (MAICS-05), Dayton, Ohio, April 2005. X. Yun, C. Aparicio, E. R. Bachmann, R. B. McGhee, "Implementation and Experimental Results of a Quaternion-Based Kalman Filter for Human Body Motion Tracking," Proceedings of the IEEE International Conference on Robotics and Automation, ICRA 2005, Barcelona, Spain, April 2005. X. Yun, E. R. Bachmann, Kavousanos-Kavousanakis, A., Yildiz, F., McGhee, R. B., "Design and Implementation of the MARG Human Body Motion Tracking System," Proceedings of the IEEE/RSJ International Conference on Intelligent Robots and Systems (IROS 04), Sendai, Japan, September - October 2004. E. R. Bachmann, X. Yun, and C. W. Peterson, "An Investigation of the Effects of Magnetic Variations on Inertial/Magnetic Orientation Sensors," Proceedings of the IEEE International Conference on Robotics and Automation, ICRA 2004, New Orleans, Louisiana, April - May 2004. X. Yun, M. Lizarraga, E. R. Bachmann, and R. B. McGhee, "An Improved Quaternion-Based Kalman Filter for Real-Time Tracking of Rigid Body Orientation," Proceedings of the IEEE/RSJ International Conference on Intelligent Robots and Systems (IROS 03), Las Vegas, Nevada, October 2003. E. R. Bachmann, X. Yun, and R. B. McGhee, "Sourceless Tracking of Human Posture Using Small Inertial/Magnetic Sensors," Proceedings of the IEEE International Symposium on Computational Intelligence in Robotics & Automation (CIRA 03), Kobe, Japan, July 2003. E. R. Bachmann, , X. Yun, D. McKinney, R. B. McGhee and M. J. Zyda, "Design and Implementation of MARG Sensors for 3-DOF Orientation Measurement of Rigid Bodies," Proceedings of the IEEE International Conference on Robotics and Automation, ICRA 2003, Taipei, Taiwan, September 2003. E. R. Bachmann, R. B. McGhee, X. Yun and M. J. Zyda, "Inertial and Magnetic Posture Tracking for Inserting Humans into Networked Virtual Environments," ACM Symposium on Virtual Reality Software and Technology, VRST 01, Banff, Alberta, Canada, November 2001, pp. 9 - 16. J. L. Marins, X. Yun, E. R. Bachmann, R. B. McGhee, and M. J. Zyda, "An Extended Kalman Filter for Quaternion-Based Orientation Estimation Using MARG Sensors," Proceedings of the 2001 IEEE/RSJ International Conference on Intelligent Robots and Systems(IROS 01), Maui, Hawaii, USA, Oct. 29 - Nov. 03, 2001, pp. 2003-2011. X. Yun, E. R. Bachmann, and S. Arslan, "An Inertial Navigation System for Small Autonomous Underwater Vehicles," Proceedings of 2000 IEEE International Conference on Robotics and Automation (ICRA 00), Vol. 24, April 2000, San Francisco, CA, pp. 1781 -1786. E. R. Bachmann, I. Duman, U. Usta, R. B. McGhee, X. Yun, and M. J. Zyda, "Orientation tracking for Humans and Robots Using Inertial Sensors," Proceeding of the IEEE International Symposium on Computational Intelligence in Robotics & Automation (CIRA 99), Monterey, CA, November 8-9 1999, pp.187-194. X. Yun, G. C. Hernandez, E. R. Bachmann, R. B. McGhee, and A. J. Healey, "An Integrated GPS/INS Navigation System for Small AUVs Using an Asynchronous Kalman Filter," Proceedings of the 1998 Workshop on Autonomous Underwater Vehicles, August 20-21, 1998, Cambridge, MA, pp. 43-49. X. Yun, E. R. Bachmann, R. B. McGhee, R. H. Whalen, R. L. Roberts, R. G. Knapp, A. J. Healey, and M. J. Zyda, "Testing and Evaluation of an Integrated GPS/INS System for Small AUV Navigation (SANS),"Proceedings of the 10th International Symposium on Unmanned Untethered Submersible Technology (UUST), Durham, NH, September 1997, pp. 101-108. E. R. Bachmann, R. B. McGhee, R. H. Whalen, R. Steven, R. G. Walker, J. R. Clynch, A. J. Healey, and X. Yun, "Evaluation of an Integrated GPS/INS System for Shallow-Water AUV Navigation (SANS),"Proceedings of the 1996 IEEE Symposium on Autonomous Underwater Vehicle Technology, (AUV '96), Monterey, CA, June 3-6, 1996, pp. 268-275. R. B. McGhee, J. R. Clynch, A. J. Healey, S. H. Kwak, D. P. Brutzman, X. Yun, N. A. Norton, R. H. Whalen, E. R. Bachmann, D. L. Gay, and W. R. Schubert, "An Experimental Study of an Integrated GPS/INS System for Shallow-Water AUV Navigation (SANS)," Proceedings of the 9th International Symposium on Unmanned Untethered Submersible Technology (UUST), Durham, NH, September 25-27, 1995, pp.153 - 167. M. J. Zyda, D. P. Brutzman, R. Darken, R. B. McGhee, J. Falby, E. R. Bachmann, K Watsen, B. Kavanaugh, and R. Storms, "NPSNET-Large-Scalve Virtual Environment Technology Testbed," Proceedings of the International Conference on Artificial Reality and Tele-Existence, Tokyo, Japan, December 1997, pp 18-26. United States Patent: Method and Apparatus for Motion Tracking of an Articulated Rigid Body, Patent No. : US 7,089,148 B1, Date of Patent: August 8, 2006.